DC Comics announces today that its iconic Green Lantern, Alan Scott, is gay. But in conversation with PopMatters, writer James Robinson suggests that this move isn't about the iconic at all. I'm going to say this in the simplest of terms. These are people's lives, these are human lives being dealt with. Because the very worst thing that can happen coming out of this, the very worst thing, is to discover this kind of attention was mishandled. To discover that this kind of attention was mishandled, handled crassly, and as a result that the LGBTQ community would find itself marginalized by the very fact of its being adulated. By now you too would have noticed that the internet has been abuzz these last few weeks with rumors that DC would, as part of its New 52 reboot, write one of its iconic characters as gay. We knew this character would be male, but not much more. We waited with bated breath. I can confirm that this character is Green Lantern Alan Scott. The Green Lantern of the Golden Age. The Green Lantern who, according to the fictive history of the DC Universe, inspired others to becoming superheroes, a generation prior to Superman. And I can confirm that this character will for the time being be written by James Robinson, in James' monthly book Earth 2. It's not the first time James has written a gay character. Seventies era Starman, Mikaal Thomas, a fixture of long-running '90s book,Starman, was gay. James even brought Mikaal into the Justice League a few years ago. The inciting incident there being the murder of Mikaal's lover, Tony, an event which eventually teamed Mikaal up with Congorilla and made of both permanent League members. Moreover, it's not the first time James has written the iconic Green Lantern Alan Scott. James first wrote Alan in his very first gig for DC, a mini-series called The Golden Age. Even back then Alan was "the big shoulders", the big guy who could carry more than his share of the water. Who regularly launched himself into the impossible, because that's who he was. So it's a singular moment in comics history. The marriage of a character who was in every sense of the word, a champion. Who not only protected people, but who nurtured people. A character who shone his inner light until there was no darkness. And at long last a gay character in the most iconic position there is -- the inspiration for a generation of heroes. It's probably the most significant moment you'll read in comics this generation. Except it's not, nor should it be. Keep thinking like that, keep abstracting away from the human, and you'll end up hurting people, as much "honoring" "them". Because the truth of this is, there is no "them". There's only us, you, me, gay, straight, in all our spectacular difference. And it's only by focusing on the human elements of this iconic moment, that we can find the truest way to honor a community even now in the 21st century stares down the barrel of Klan-levels of intolerance and cultural cruelty. So the question becomes, how do I know this moment won't slip away into the anonymity of the iconic? How do I know that human lives will be emphasized, and that that "us" won't sacrificed, won't be marginalized, won't be lost? And in his very first words to me, in his very first response, he said that kind of thing that just simply burst the walls of my heart. "If I open my heart, there'd be no space for air," Skunk Anansie sing on their album Sunburnt & Paranoid. This is so much better than even that. James' words absolutely, unflinchingly disarm any kind of iconification of this moment, and leave only the human. "Actually," James says in response to my asking him how writing Mikaal Thomas and the earlier Alan Scott would have prepared him for writing Alan as gay, "I don't think it has." There's no more compassionate a response than this one. Because what James was really saying was this: "Shathley, you're on the wrong footing here. This isn't about the iconic nature of the character. This isn't about the iconic nature of the political statement being made here. Or even about crafting a moment that will stand the challenge of history. This is about the personal. This is about the human." 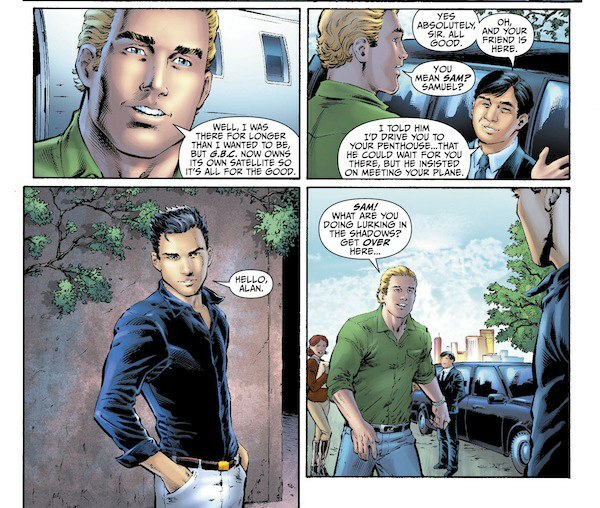 Alan Scott's not "gay", James emphasizes with me time and again, he's a character who also happens to be gay. Also happens to be gay among the hundred other things he is--a hero, perhaps the keenest business intellect on the planet, and employer to thousands with his media empire, the "Big Guy" as James reminds me, the guy who always takes responsibility, a champion. Because being "gay" without the character having any other depth to flesh him out, would merely be a political statement. Instead, Alan Scott is that same generationally defining character he always was. He is that courage and that clear valor. He is an internet billionaire who made his fortune in much the same way Mark Zuckerberg made his, James tells me, through media and understanding the social graph which interprets the relationships between us all. And that same passion and sense of responsibility, when directed into superpowers and taking on the role as champion for Earth, is what brings Alan Scott into being the inspiration for a generation of heroes. "I did a story with Alan [Scott] later on, in The Justice Society, issue 43," James tells me as we begin to speak about perhaps the most personal moment James himself had in coming to this decision. "Just him talking with his son and bonding with him. He had a son, as he'd grown into an older man. A son called Obsidian, who was gay, and it was them talking about their differences and their similarities. And ultimately Alan, just reminding us that although he's from a different era than Obsidian, he loves his son, and he wants his son to be happy. That was the most important thing. And that was me, speaking as how a parent should be if they have gay children -- the bottom line is you just want your children to be happy and to lead good lives. So, all that was on my mind, and with the reboot, making Alan Scott young again, I realized there was no more Obsidian. He obviously didn't have a son, gay or not. And I thought that that was a shame, that we, well we as DC Comics, had lost a gay character, particularly one that people liked so much. So from there it just occurred to me. I'll just make Alan Scott gay. And I'll make him as the leader of the Justice Society, he's a Type-A dynamic, heroic personality. He's somebody who will die for the planet. He's the Green Knight who protects the Earth. He has the power of the Earth. On a power scale, apart from being able to have this ring that wields green energy, he has super-strength, super-speed. He's the perfect hero. And he happens to be gay. That's just a part of his personality. But it isn't the only defining aspect of who he is. He's a complex and interesting and honorable, heroic man at the same time." And we continue speaking, onwards into the afternoon. As James continues to sketch out his finely-woven vision of Alan Scott, I'm struck not only by the magnificence of this vision, but by something else. Something older, something earlier, something from my past as a reader and a fan of James Robinson's. The iconic cover to Starman #29 is summoned up by my imagination. Not so much the cover itself. Or even the issue itself, which chronicled the return of Bobo Bennetti, a rat-pack-esque-hood-turned-private-citizen-turned-Opal-City-protector. But what use was made of that cover is the moment that stands out for me now, as James and I continue to talk. A house ad ran some months around the release of issue #29, with more or less that cover as the artwork, and a single banner that read, "Join the Revolution". I remember smiling back then. I'd been reading Starman for some time, and I'd already realized that it was indeed a revolution. That years in advance, of either This American Life or FaceBook, James himself had conceived of a story the art of which lay in finding and describing and fleshing out those deep and meaningful connections that made an "us" of us all. And here I am, talking with James, on the cusp on another revolution. Please enjoy a preview of the generationally relevant pages. The landmark second issue of Earth 2 is on sale this coming Wednesday June, 6.